Ginseng fortified milk sounds like it may just work. While we are at it we need to add cocoa powder also and please skip the sugar. That way the customer retains control. Milk is certainly indicated for individuals suffering from various nutritional deficiencies and that typically includes the aged. I also know that ginseng is valuable in stabilizing imbalances caused by menopause (Chinese type at least) Other likely hormonal imbalances may also be corrected. Here they tackle the problem of how to make it all palatable. 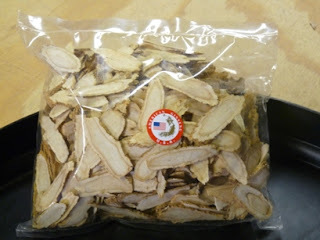 The easiest way is to take a dried slice of ginseng and place it in you mouth. It takes a few moments, but the ginseng will rehydrate and mastication will then soften it and allow it to be well chewed and consumed. However, consuming it in milk product certainly has merit and can make the product far more readily available. American ginseng is reported to have neurocognitive effects, and research has shown benefits in aging, central nervous system disorders, and neurodegenerative diseases. The challenges of incorporating ginseng into food are twofold: it has a bitter taste, and food processing can eliminate its healthful benefits. Reporting in the August issue of the Journal of Dairy Science, a group of scientists has formulated low-lactosefunctional milk that maintained beneficial levels of American ginseng after processing. An exploratory study found the product was readily accepted by a niche group of consumers. "Our goal was to develop low-lactose milk that could be consumed by the elderly to improve cognitive function," reports lead investigator S. Fiszman, PhD, of the Instituto de Agroquimica y Tecnologia de Alimentos (IATA), Consejo Superior de Investigaciones Cientificas (CSIC), Patema (Valencia), Spain. "Consumers who were interested in the health benefits of ginseng rated our product quite highly." Because older people frequently have trouble digesting milk products, the researchers developed a low-lactose formula. American ginseng was added, and then the milk was sterilized by ultra-high temperature processing (UHT), which prolongs shelf life. Analysis found that sufficient levels of ginseng remained in the milk after treatment to improve cognitive function as reported in the literature. To reduce the bitter taste of American ginseng, the investigators developed samples with vanilla extract and sucralose, a zero-calorie artificial sweetener. In a preliminary study, 10 tasters with a good ability to discriminate between flavors compared low lactose UHT milk without any additives (the control) to low lactose milk with ginseng extract, vanilla aroma, and sucralose added before UHT treatment. They developed a list of 10 attributes that described the sample: color, sweet odor, milk flavor, vanilla flavor, metallic/root flavor, sweetness, bitterness, aftertaste, astringency, and viscosity. They then rated the intensity of each attribute for five samples; the control; the control with ginseng extract, vanilla aroma, and sucralose added; the control with ginseng extract added; the control with vanilla and ginseng extract; and the low lactose milk with ginseng extract; vanilla aroma; and sucralose added before UHT treatment. In a second study, 100 participants were asked, on a scale of one to five, how willing they would be to consume a "highly digestible semi-skimmed milk," and a "highly digestible semi-skimmed milk enriched with ginseng extract that would improve cognitive function." Then, they tasted and rated, on a scale of one to nine, the overall acceptability of the control milk and the low lactose milk with ginseng extract, vanilla aroma, and sucralose added before UHT treatment. Both the presence of ginseng and the thermal treatment affected some sensory properties of the milk. The addition of ginseng significantly increased the perceived light brown color in the flavored and unflavored samples, and was highest in the reduced-lactose milk with ingredients added before the UHT treatment. The sweet odor was more intense in flavored samples, but decreased slightly in the samples of milk with ingredients added before UHT treatment. Bitterness was clearly perceived in the samples containing ginseng additives, but was lower in flavored samples, indicating that the vanilla aroma and sucralose masked, to some extent, the bitter taste caused by ginseng extract. Consumer responses varied greatly, depending on interest in the product. 78% indicated that they would be likely to consume the highly digestible milk, and after tasting the product, 87% of them indicated they would buy the sample. 47% indicated they were not interested in milk enriched with ginseng, and after tasting, they gave it a low acceptability rating. However, for the 32% of consumers who did express an interest in the product, 75% declared they would buy it. "Drinking 150 to 300 mL of this ginseng-enriched milk would provide the amount indicated to be effective for improving cognitive functions. Combined with the low levels of lactose, this makes the drink an appropriate functional beverage for the elderly," says Dr. Fiszman. "Among consumers more likely to consume ginseng products, the newly developed milk was well accepted. The addition of more congruent flavors such as chocolate, citrus, or coffee, could be more effective in masking non-milk-related sensory attributes, Other alternatives could be investigated." Commenting on the studies, Susan Duncan, PhD, professor, Department of Food Science and Technology, Virginia Tech, noted, "With the combination of intrinsic health benefits in milk and these additional ingredients, milk becomes an easy way to deliver valuable functional ingredients and the functional benefits of milk components. Diversifying the product line for milkand dairy products has a number of benefits, including market and consumer visibility and perception." Ginseng Fortified milk improves cognitive function, which is good for our health.